Why are shark flies orange or orange? Skip May 18, 2017 FEATURE STORY, Slide No Comments on Why are shark flies orange or orange? 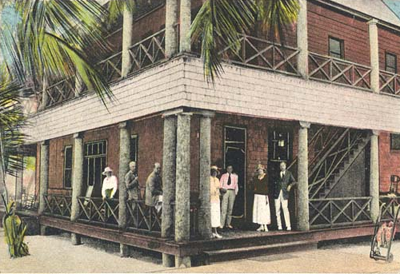 Image is of the Long Key Fishing Club Lodge, 1925. Zane Grey was president of the LKFC from 1910 to 1919. He visited almost every year thereafter through the 1925 season. The lodge was built in 1908 by Henry Flagler (Over the Sea Railroad) as a hotel stop for the rich and famous of the day. The rail road and LKFC were permanently destroyed by the infamous 1935 hurricane. Image Source: KeysHistory.org. In 1910, Zane Grey, the granddaddy of the western novel and brother RC serendipitously arrived in Long Key, roughly midway to Key West, via Henry Flagler’s then famous Over-The-Sea-Rail-Road. Grey became the sole spark for the word getting out that there was great angling in the Keys. His magazine stories about bonefish, tarpon, sailfish, sharks, and many other species thrilled readers through the Roaring 20s. Most of the impetus for fly fishing saltwater originated in South Florida, more specifically Miami and south to the Florida Keys. The list of those contributors is long, anchored by dozens of legendary names whose stories line the walls of The Fishing Hall of Fame at the International Game Fish Association in Dania Beach, Florida. Many of those legends are still at it today. Legends, Norman Duncan, John Emery (deceased), Chico Fernandez and Flip Pallot attended the University of Miami in the early 1960’s, since then they have become legends fly fishing in South Florida and the Keys. Norman invented the Duncan Loop, which was renamed the uni-knot by an outdoor writer. He also invented the “outside fly” – a later version became known as the Deceiver. 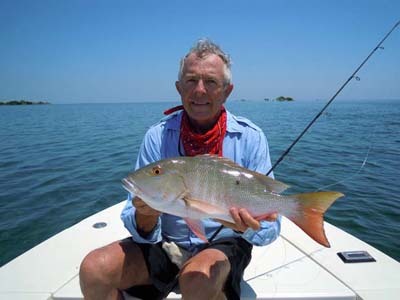 Norman Duncan today with a Biscayne Bay mutton snapper. Duncan image. Around 1955, John Emery came into the tackle store where I worked building custom rods and repairing reels. Since he was also interested in fly fishing, we became fishing buddies. We would take his Triumph TR3 or my Volvo PV544 and drive out the Tamiami Trail to fish the canals on the west coast or go down to the Florida Keys to fish roadside flats and the canals in new housing developments. Occasionally, if we headed back early in the afternoon we would stop at the roadside just north of the Jewfish Creek Bridge to wade the flats along Barnes Sound. At that time there was a fish house on pilings out in the Barnes Sound called “Manatee Smoked Fish,” they also sold fresh fish and turtle meat. We found that they slaughtered the turtles and fish then at night then threw the carcasses out the back door into the sound. Even driving by we could see the small bonnet and lemon sharks cruising these beautiful white sandy flats. We would buy the best smoked fish from their market and find out when they were going to dump a load. 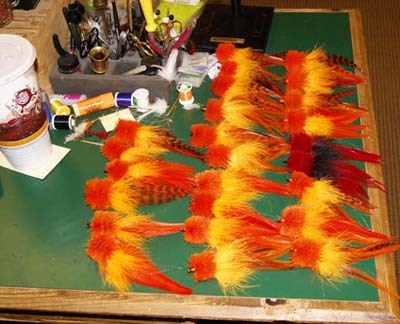 While fishing the canals and channels we often used the orange/yellow streamer fly that had been recently developed for tarpon by Kay Brodney and Jim Adams, usually, we tied a shock leader on the tippet, sometimes with wire. If we didn’t re-rig we would use some of these same flies when we waded these flats. Shark flies tied by Grant Gisondo. Gisondo image. We discovered that the sharks and barracudas would respond best to the orange/red flies, we thought that these colors best imitated the carnage that they were feeding on from the smokehouse. At about this time I read a report that the US Navy had tested several different life rafts out in the ocean by dropping them all well offshore. When they came back a week later they found that the rafts from one of the manufacturers had one side ripped apart apparently by sharks. California sharks are orange fans. Image credit On The Fly Charters. It turned out that this manufacturer had their specifications written on an orange patch at the waterline! John and I were not at all surprised at this finding. In the early 1960s, Little John and I joined some of the local fishing clubs. The members were keen on learning as much as they could about all aspects of light tackle fishing, especially salt water fly fishing. 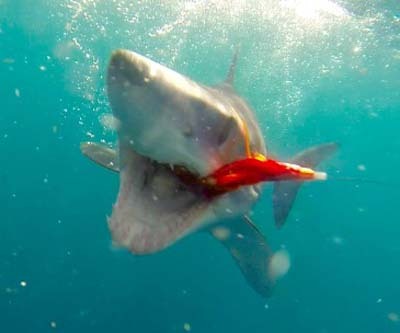 When the subject of how to get the normally near sighted sharks to respond to a fly we recommended using orange/red streamer flies since we had found them to be the most effective. At this time I caught my first sizable barracuda (9-pounds) with this orange fly while wading the flats behind Big Torch Key. From there this concept took off in the fly fishing circles, although I still don’t know for sure if Little John and I were the ones to first introduce this fly pattern to saltwater fly fishing. NOTE: Featured Image by www.prensa.com.